Last November, I had the opportunity to share the story of Parker Pennington and his unique creation — Skate Dance Dream. If you missed it then, go ahead and read it now. Trust me, you’ll want to read the story again, even just as a refresher, because, the show was such a hit that it’s back yet again! And, of course, it’s better than ever. I had the chance to ask Parker about last year’s final show in Clinton, NY. And, no surprise, all the participants had the time of their lives. That was then. This is now. And Parker and company are hard at work setting the stage for yet another remarkable night filled with current and future stars from the worlds of dance and skating. 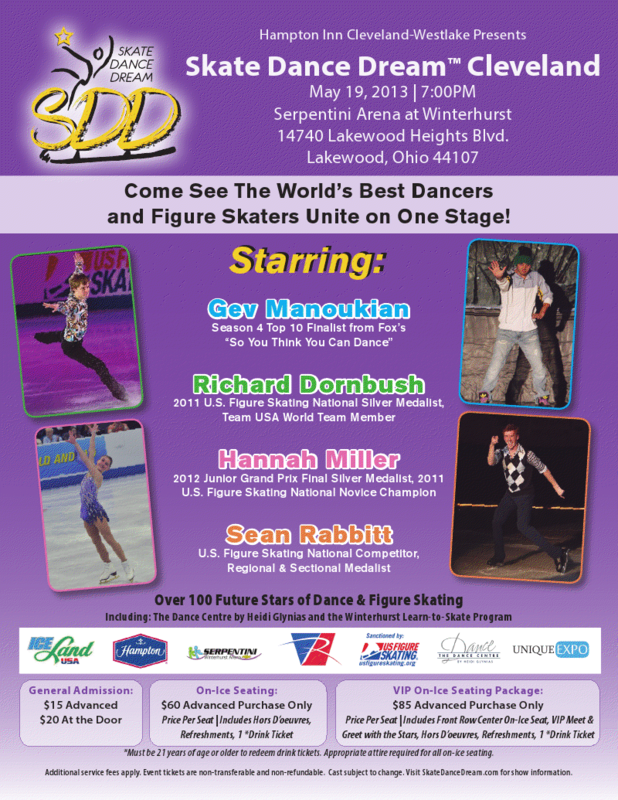 Cleveland, Ohio will play host to a show on May 19, staring Gev Manoukian, Richard Dornbush, Sean Rabbitt, and up-and-comer Hannah Miller, as well as a whole crew of young skaters and dancers. Well? What are you waiting for?! Get your tickets. Reserve your spot! See the stars and help encourage the youngest to the oldest to dream big!